Format: Four-round random draw, then knockout. 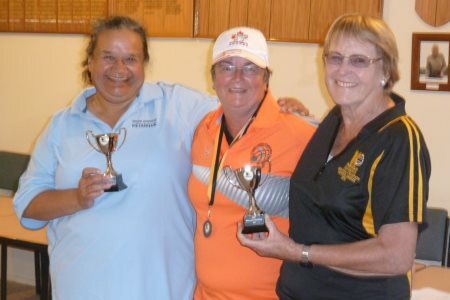 Christine Daykin/Trish Smart (Manawatu), Yvonne Futcher/Sheryl Parslow (Wanganui East), Ann Hogg/Jan Holloway (Horowhenua), Barb Johnston (Masterton)/Barbara Nicholls (Park Avenue) 5 equal. Diane Brunton/Shirley Fraser (Otaki), Frances Johns/Glenys Reeves (Horowhenua), Val Long (Otaki)/Sheryl McFadgen (Kapiti), Robin Mann/Tommy Werry (Park Avenue) 5 equal. Erica Drake/Viv Pender (Hataitai) 3. Yvonne Futcher (Wanganui East)/Barb Johnston (Masterton)/Annick Le Guen (Kapiti), Carole Lacoste/Beth Miles/Pat Scholes (Kapiti) 3 equal. Joan Finn/Jan Holloway/Glenys Reeves (Horowhenua), Linda Gazzard/Sheryl McFadgen (Kapiti)/Barbara Nicholls (Park Avenue) 3 equal. Format: Four-round random draw, 60 minutes, plus 1 end. 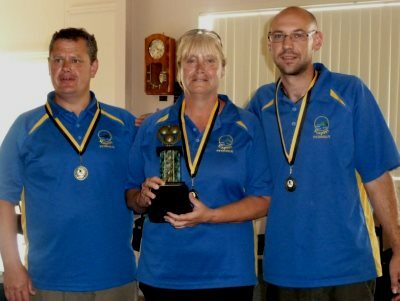 Sharon Cannon/Murray Porter/Brian Smith 9, Dave Gatchell/Lew Gill/Shirley Selwyn 13. 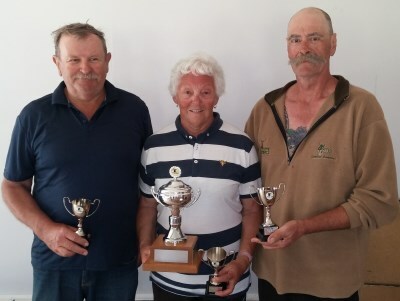 Grant Bray/Michael Rocks/Peter van Heusden 7, Dave Gatchell/Lew Gill/Shirley Selwyn 13. Jack Gazzard/Linda Gazzard/Harl Stevens 6, Shirley MacDonald/Enoka Smiler/Monica Smiler 13. Steve Frampton/Ann Hogg/Graeme Morris 13, Shirley MacDonald/Enoka Smiler/Monica Smiler 6. Yvonne Futcher/Barbara Nicholls/Alan Taylor 10, Alan Cameron/David Smart/Willie Tipene 13. Pete Hamilton/Barb Johnston/Joan Miller 13, Alan Cameron/David Smart/Willie Tipene 1. Derek Cooper/Elva Cooper/Paul Husband 13, Noeline Corley/Ann Dowds/Tony Farmer 12. Ian Bailey/Christine Daykin/Judith Smith 13, Derek Cooper/Elva Cooper/Paul Husband 11. Played at Kapiti Pétanque club. Claire Bradburn (Silverstream)/Monica Smiler (Park Avenue) 11, Yvonne Futcher (Wanganui East)/Annick Le Guen (Kapiti) 7. Christine Strichen (Wanganui East)/Claire Wilson (Masterton) 13, Linda Gazzard/Sheryl McFadgen (Kapiti) 6. Margaret Mordecai/Barbara Nicholls 13, Christine Strichen/Claire Wilson 6. 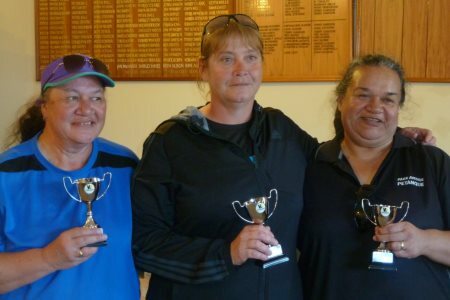 Jo Maxwell/Lynne Shepherd (Kapiti) 3, Ann Hogg/Shirley MacDonald (Otaki) 13. Rosemary Barrack/Gabbie Kanel 2, Ann Hogg/Shirley MacDonald 13. Jan Poland/Judith Williamson (Kapiti) 11, Christine Daykin/Judith Smith (Manawatu) 13. Yvonne Futcher (Wanganui East)/Annick Le Guen (Kapiti)/Monica Smiler (Park Avenue) 8, Claire Bradburn (Silverstream)/Ann Hogg/Shirley MacDonald (Otaki) 6. Sharon Cannon/Christine Strichen/Claire Wilson 6, Yvonne Futcher/Annick Le Guen/Monica Smiler 13. Linda Gazzard/Sheryl McFadgen (Kapiti)/Barbara Nicholls (Otaki) 11, Jan Poland/Yvonne Reeks/Judith Williamson (Kapiti) 12. June Cody/Jo Maxwell/Lynne Shepherd 13, Jan Poland/Yvonne Reeks/Judith Williamson 6. Erica Drake/Catherine Maher/Viv Pender (Hataitai) 4, Francis Johns (Horowhenua)/Margaret Mordecai (Otaki)/Marilyn Trembath (Horowhenua) 13.